Before Washington Nationals fans get upset at Metro, the agency wants to make clear it is up to the team to decide whether the rail system should stay open late for any playoff games. WASHINGTON — Before Washington Nationals fans get upset at Metro, the agency wants to make clear it is up to the team to decide whether the rail system should stay open late for any playoff games. “Let the record be clear that it is up to the Washington Nationals to pay for the late-night hours. If they choose not to pay, then it will not stay open and it is not Metro’s fault, so we don’t want to get Metro booed at one of these games again, because it’s not our decision whether it stays open late or not,” said Jack Evans, Metro Board chair and D.C. council member. The Nationals did not respond to requests for comment on whether they would pay for or organize another way to provide the extra service, or how long after first pitch the team hopes Metro will run. While the times of the Division Series games have yet to be announced, the dates of the first-round home games suggest the extra time is likely to be the most significant problem in the opening series for a Game 5, if necessary. “Last year, I stood there and everyone booed when they said Metro was going to close,” Evans said. Metro General Manager Paul Wiedefeld had decreed that there would be no extra hours for special events between June 2016 and July 2017, but issued a new policy a few months ago that allows the extra hours for large events if organizers submit a deposit of $100,000 per hour to cover Metro’s costs tied to the extra service. 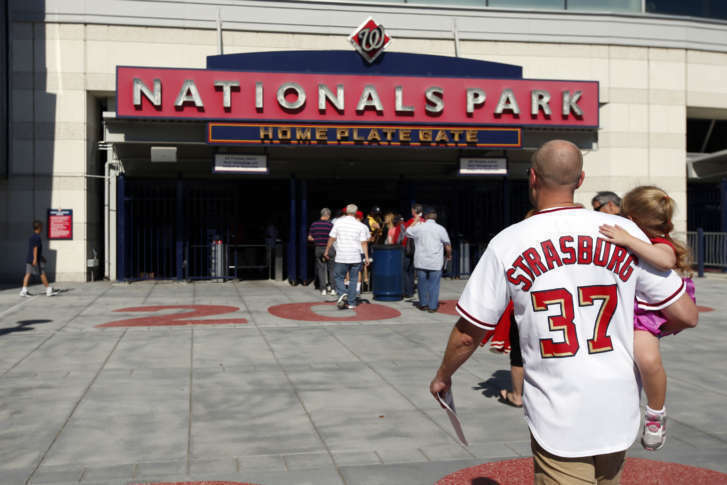 The previous charge had been $29,500 for an extra hour of service, but the Nationals have balked at even putting that deposit down in the past, instead relying on outside groups to step in. As in the past, organizers will be refunded the value of any fares that are paid during the extended service. The Nationals are scheduled to host the first games of the best-of-five NLDS against the Chicago Cubs on Friday, Oct. 6 and Saturday, Oct. 7. On each of those days, Metro is regularly scheduled to close at 1 a.m., with the last train to Greenbelt leaving Navy Yard at 12:52 a.m. and the last train to Branch Avenue leaving at 1:18 a.m.
Game 5 is scheduled on a Thursday though, when the last trains depart 1.5 hours earlier since the transit system closes at 11:30 p.m. on weeknights. If the other NL Division Series does not go the distance, the Nationals would likely be scheduled to play at 8:08 p.m.
MLB playoff games average about 3.5 hours, which means many games take longer. If the Nationals reach the best-of-seven League Championship Series, Metro’s closing time could be an issue for games 2 (Sunday, Oct. 15), 3 (Tuesday, Oct. 17), 4 (Wednesday, Oct. 18), 5 (Thursday, Oct. 19) and 7. The team with the better record hosts the first two and last two games of the best-of-seven series, while the lower seed hosts games 3, 4 and 5. Game 7 is scheduled for Sunday, Oct. 22, when Metro has already added an early opening for the Marine Corps Marathon.